This probably should have been my 300th post. Oh well. Liam, this is really nice! Summarizing ancestral state reconstructions of a continuous trait in a non-abrupt way has always been challenging, but this solves that problem. Hmm. Is there anyway to map uncertainty in a similar way; maybe by smoothing out the range of per-node confidence intervals across the branches? I'm wondering whether is it possible to invert colours used in this function, e.g. the largest values red and the lowest values blue? It seems to me as a more logical way. I was trying to do it myself, as it seemed easy, just invert the scale of "cols", though I got stuck on "object 'getState' not found". Would you mind give me a clue what to do? Phylogenetic tree with 10 tips and 9 internal nodes. Not sure. Why don't you send me your tree file and I will troubleshoot? I am dealing with the same error. What I am doing here is first transform the branch lengths of a phylogeny using the alpha parameter I obtained from a OU fit. Then, I want to perform an ancestral state reconstruction. It is true that, the transformation with the OU alpha makes some internal nodes close to zero, but even using "di2multi" I keep obtaining the same error. Please can you post how you solve this problem? Hi Oscar. Try increasing tol in multi2di. tol is the shortest branch length that is considered to be "zero length". Eventually, I will fix this bug. Sorry for the inconvenience. Note if you plot the OU tree the branch lengths will be stretched according to your OU model, which you may not want. more elements supplied than there are to replace' message. Increasing tol in multi2di doesn't seem to do the trick. Any other suggestions for how to solve this problem? Any insights appreciated. Actually Liam, solved it by increasing the res value. Please ignore the previous query. I may be missing something obvious here, but is there a way to use the very nice plotting function utilized in contMap to plot data for a tree where the states at nodes have already been estimated? Thanks! Not presently, Ben. Great idea. One of the problems is that contMap estimates the states along the edges of the tree (as well as at nodes). (It does this using an equation from Felsenstein to interpolate - but this is equivalent to what we would get at any intermediate point along the edge if we had a node there.) If you have ancestral state estimates from an alternative model of evolution, then interpolating in this way becomes invalid. One alternative is to use plotBranchByTrait & then just color each edge by the state at the parent or daughter node (or their arithmetic mean). This is not too difficult to do & you can probably find demos on the blog; however you lose the continuous color gradient of contMap. Will check try plotBranchbyTrait. An alt might be to associate ancestral state with node labels then plot with FigTree- but will be a bit awkward to do I think...Hope to see something along these lines implemented in phytools at somepoint in the future! (start labeling at root from 1+no of tips). traits need to be a vector of tip values AND node values, with node labeling following phytools, rather than ape naming. Yes - I'd forgotten this myself, but it looks like if mode="nodes" then the vector x should be in order of the node numbers in tree$edge - that means 1:N (for N tips) should be the tip values in order tree$tip.label, and (N+1):(N+m), for m internal nodes, should be the nodes in the order of tree$edge. Let me know if this makes sense! Yes thats what I did. In the end, I found the simplest way to make a pretty gradient shaded tree was to use the writeAncestors() function, then pop the tree into FigTree. Not very elegant but it works! I have tried all the solutions presented here, and none of them have worked. In addition, I have 3 trees and trait sets, all of which are sub-trees of one larger tree. One of these works fine with contMap, but the other two return the error I mentioned above. Also, the one that works has a polytomy in it and works without first using multi2di, the two that fail also have polytomies, yet fail. 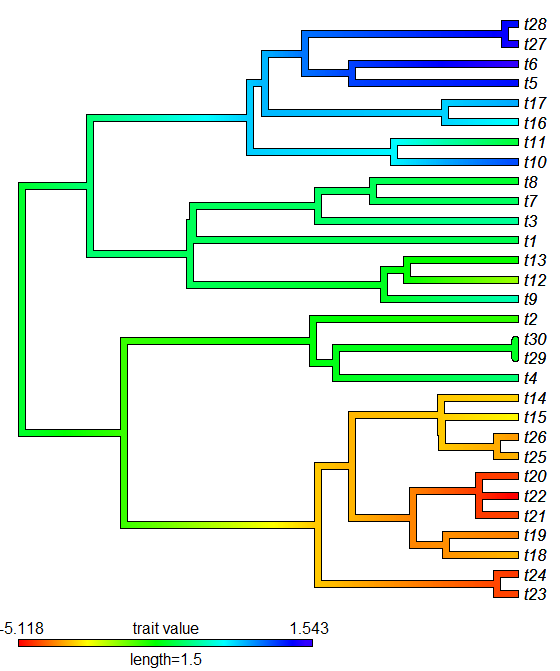 My phylogeny was fine; it worked when I used simulated data (fastBM). The problem was that contMap needed a named vector (which you, in your defense, state explicitly in the documentation). ...which worked. Thought I'd share in case someone else has the same problem. Btw Liam, thanks for getting the last round in Seville. It was fun; hope to meet you at another conference, and I'll get you back.